Anne earned her Doctorate degree in Physical Therapy and her Bachelors of Science degree in Exercise Physiology, both from the University of Massachusetts Lowell. 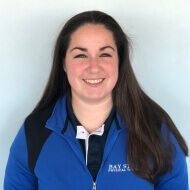 Originally from Beverly, MA, Anne was a three sport high school varsity athlete in softball, basketball and field hockey. She went on to be a competitive collegiate rugby player and then assisted in coaching her college women’s team through graduate school. Anne continues to enjoy these sports both as player and a spectator. Anne has drawn upon her own orthopedic injuries to both empathize and motivate her patients to return to their prior level of function and achieve their own personal goals. Anne treats each patient with a comprehensive and individualized approach to achieve maximal recovery. Anne’s passion lies in orthopedics with a special interest in sacroiliac joint dysfunction and sports injuries. In addition to her strong orthopedic skill set, Anne has proficiency in vestibular rehabilitation and concussion assessment.